For testing, temperature indicating paint was applied to the part, which melts when the part reaches the targeted temperature. It took 30-40 seconds to heat one end of the sample to temperature. The part was rotated during heating by hand to normalize the heat produced and remove the effect of any localized hot spots. Feasibility of the application with an Ambrell induction heating solution was confirmed by THE LAB. 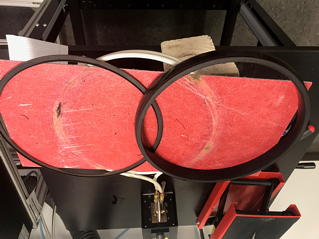 The speed and precision of induction heating from Ambrell, along with the expertise of the application experts at THE LAB, were key reasons why the client turned to Ambrell. Click here to learn about other bonding application processes that THE LAB at Ambrell has designed. Interested in getting your application tested by THE LAB? Just fill out this form to get started!